Right after our announcement that we want to hire a second contributor part-time, our Patreon campaign got a huge boost beyond that goal and towards the next. It was in fact due to arrival of our first Platinum sponsor, Enjin Coin, bringing us an additional USD 1,500 of funding every month! On top of this sponsorship, they announced their support of our project and intent to develop a Godot module to make their open source framework available for Godot developers. Enjin Coin (ENJ) is a "smart cryptocurrency for gaming" coupled to the Enjin gaming platform. This cryptocurrency can be used as a backend for in-game virtual goods, which can therefore be traded and transfered between different games relying on Enjin Coin. You can check their detailed whitepaper and website for more details on this blockchain-based technology. As mentioned, they intend to make their platform available for Godot games by developing an official module for Godot 3, and they will likely get help from experienced Godot developers(*) to ensure that the module works out of the box. 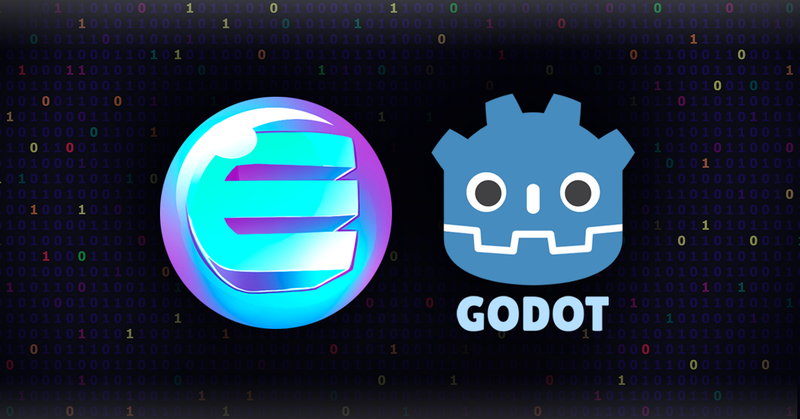 “Godot is an incredible game engine and the Enjin Coin integration will open up true gameplay innovation. We look forward to supporting game developers using Enjin Coin based virtual goods in Godot powered games”, says Maxim Blagov, Enjin Coin's CEO. We are thrilled to see such companies take an interest in our engine, and are looking forward to the opportunities that it may offer to our community. Enjin Coin is our first Platinum sponsor, but not the first company to show their interest in our engine via financial support. Since the Patreon campaign started, two other companies became Gold sponsors: Gamblify and GameDev.tv. We will soon post new blogs about each of them to thank them properly and tell you about their interest in Godot Engine! If you are interested in becoming a sponsor of the Godot project, head over to Patreon to see our sponsoring tiers and corresponding perks. Stay tuned for more details about our sponsoring plans this blog! (*) As per Godot's non-profit structure and charity backing, as well as our SDK agnostic development philosophy, this work cannot be carried out by core Godot Engine developers directly as part of the project's roadmap. Still, any company is allowed and welcome to propose work for hire to Godot contributors if they want help proposing thirdparty modules for their technology.